FiCall : FiCall.com | Free Video Calls, SMS, Mobile Calls, Online TV | Free Pc to Phone Calls, Free Voip Calls to India International ! FiCall, a London based voip service offering free voip, free phone calls, sms, free video calls, chat, online tv. Ficall is one such service which offers a lot of things, you will definitely find something useful for you. With FiCall, you can experience free call, free SMS, free international calls, free video call & free chat using your mobile phone or PC. FiCall uses the Voice over Internet Protocol (VoIP) technology that enables you to talk with any destination around the world for free. Ficall is currently offering $1 credit to every signup to let the new customer try their international calling service. You can use this free credit to make calls to any country. $1 credit by Ficall will enable you to make approx 35 min of free calls to India. 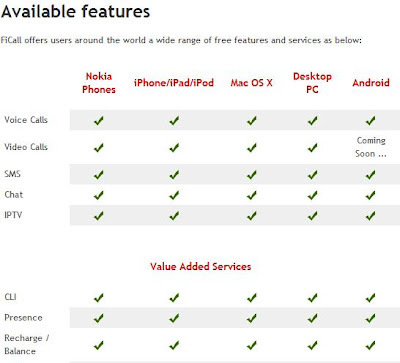 If you’re looking to use FiCall on the go, the FiCall mobile client enables you to use all FiCall VoIP services for free with FiCaller (FiCall-FiCall): make free phone call, make free international calls, send free SMS, make video call or video chat and chat for free. To recharge your account to make phone calls and send SMS with low international call rates all you have to do is enter your desired payment increment and start talking. To start using FiCall, all you need is an internet connection, a mobile phone or PC, and an active FiCall member account. Taking advantage of free phone call/voice call, free international calls, send free SMS, video call/video chat, free chat and Online TV is just one step away with FiCall! To get free credit with Ficall, use your correct email address and mobile number while registering. 1. Ficall in your PC. You can use Ficall PC application to make Free PC to Phone Calls. 2. Ficall in your iPhone. Use Ficall iPhone application to make calls from your iPhone. 3. Ficall in your Nokia mobile. 4. Ficall in your Android Mobile. Use Ficall Android application. Another good feature which I liked about Ficall is its Mobile IPtv. You can Watch your favorite series over FiCall’s mobile IPTV without fees. FiCall is among the first VoIP services to offer video calls on mobile phones. This unique advantage enables you to conduct free video call all around the globe anywhere & anytime with your friends & your family. Moreover, FiCall mobile application can be operated using any internet connection be it Wi-Fi, WAP, GPRS, EDGE, UMTS, 3G and WiMax. Its time to check out Ficall Voip Service. Please share your feedback with us. it was really good to read this blog because its good but i want to know that with whom should i go with my business purpose because i searched the UK and found some Business mobile phones on contracts but still am searching. Are there any recharge voucher's for ficall? Can I make phone to phone video calls? Sending text messages now is not restricted to only mobile phone users only. Now via few social networking websites people can send free sms to almost every corner of the world and that too at very nominal charges.